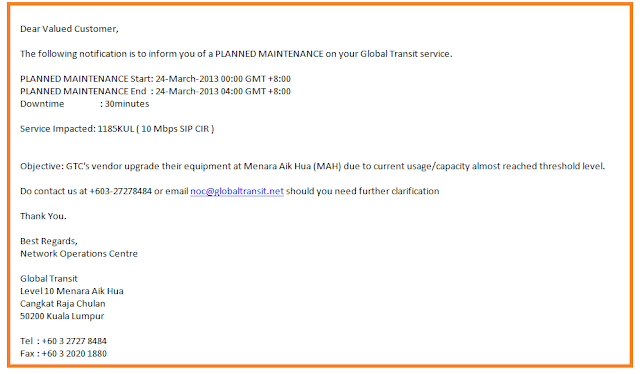 We received a planned notification email today (12th March 2013) from our upstream provider, Global Transit to upgrade their existing network equipment. The upgrade will be on our AIMS datacenter in Menara Aik Hua (MAH), and it is due to current usage/capacity almost reached threshold level. This maintenance will ONLY affect all our Hybrid network clients, while nothing is affecting to our Premium network. The maintenance will start on 24-March-2013 00:00 GMT +8:00, and end on 24-March-2013 04:00 GMT +8:00. For more information, please refer to the email image that captured from Global Transit. Feel free to contact our network team at cvs@everworks.com for more information.